Tilman Pass Trekking is recognized as a off the beaten trek located in Langtang Himalayan range of Nepal, offers amazing Langsisha glacier, tranquil sacred lakes of Panch Pokhari and the extremely remote Jugal Himal, which links the Himalaya from Kanchenjunga in the East to Dhaulagiri in the West. Langtang trekking is very famous to explore Red Panda an endangered animal of Nepal located north from Kathmandu, the capital of Nepal. 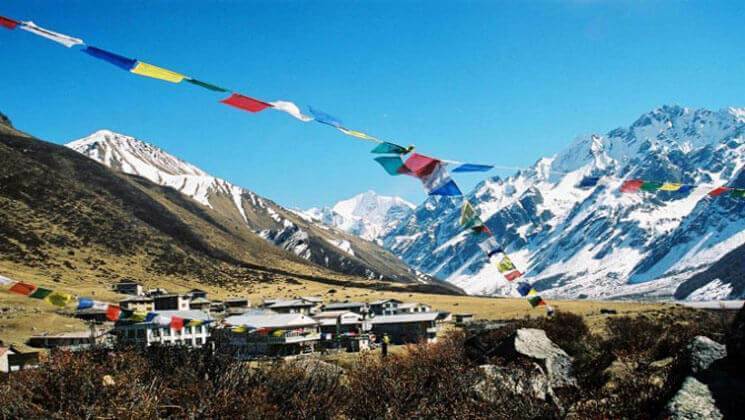 Langtang National Park is home of several wild animals such as Musk deer, Himalayan black bear, snow leopard, Himalayan wild goat and particularly birds and wildflowers. Tilman pass trek is the home of the including rare red panda, verities wildlife and diverse vegetation and inhabitant of Tamang ethnic group. Furthermore, Tilman pass trek is covered with varieties of alpine wildflowers and the forests are multi-colored with colorful rhododendron, orchids, magnolia, and many other floral species. Moreover, you will have the best view of Mt. Ganesh Himal family, Mt.Langtag lirung (7,246m), Langtag-ri, Langsisa peak, Langtang Himal, Ganjala peak. Tilman pass Trek was named after a pioneer British mountaineer – explorer H. W. Tillman (1898 – 1977) who explored the Himalaya in the mid 20th century. Tilman pass trekking basically, arranges as camping trek but we can offer you camping and mixed with lodge whereas a possibility. Tilman pass trekking is also a part of Great Himalayan Trail (GHT) of Nepal, can be done in any time (except winter) throughout the year. Our Tilman pass trekking itinerary compared to most walks in this region leading up to the glacier. The particular route is designed for world travelers who wish to hike an adventurous trek destination over Langtang region but are walking within a more relaxed manner than take a look at this itinerary. Upon arrival in Kathmandu, Tribhuwan International Airport, we will receive you with private vehicle and transfer to hotel in Kathmandu within B/B plan. Our representative will give you information about Tilman pass trekking programs. Have a breakfast at the hotel, drive few minutes to catch up coach for Syabrubeshi with your mountain trekking guide and porters. Enjoy seven our scenic drive through Trishuli bazaar with beautiful small villages, river valley, and mountains. The bus stops roughly about 30 minutes on highway restaurants for lunch in Trisuli. You will be reached at Syabrubeshi bazaar around 2 or 3 o’clock midday. Stay overnight in a lodge at Syabrubeshi. You start your walking at your own pace and the trail ascends for around two hours through the forest followed by a climb of about an hour to reach Bamboo village. Furthermore, the trail follows the upstream and can be seen birds life around the bushes. Beehives hanging on a cliff are another attraction for the visitors on walking. From here you will again steeply climb through the bamboo forest to reach the Lama Hotel. Overnight at Guesthouse. Today you will have a pleasant walk and follow the trail through rhododendron and pine forest for around three hours to reach Ghoda Tabela where you will stop for lunch. This surrounding area dense wild habitat area and many small babblers with a lot of herbals possibly find here. Furthermore, walk through a scenic trail takes you to Langtang village where you will relax for the evening. Have in mind, Langtang whole valley was destroyed by massive Earthquake disaster in last April 2015 and then rebuild again. Overnight at Guesthouse. Kyanjin Gompa is the last destination of your trekking at an altitude of 3,817 m / 12,519 ft above sea level. From here you will have beautiful views of Mt Ganchempo and Mt. Langtang Lirung. You will visit surrounding area like Yak cheese Factory, Kyanjin Monastery and local houses. Overnight at Guesthouse. Hike to Kyanjin ridge to get super view of Langtang Himalayan range includes Mt.Langtag lirung, Langtang ri, Langsisa pass, Langtang Himal, Ganjala peak, Yala peak and many other border peaks. However, if you are interested your guide will take you to climb Tsherko Ri (5150m) peak to experience even better views of Himalayas but this is only optional. Then visit Langtang glacier and Langshisha Kharka (the beautiful yak pasture land). Return Kyanjin for a rest overnight. An exciting day of preparing of our camping crew Langshisa Kharka. As you are walking on yak pastures and lonely routes, the trek of totally off the beaten path and non tourist area. Stay overnight at tented camp. The trek is on the high alpine vegetation and pure of nature. We walk the Moraine Camp which is situated at an altitude of 4650m and it is one of the highest points of our trekking. Today trek is about 6 hours and more depending upon the speed you make. Stay overnight at camp. Today the journey is quiet tough and strenuous but exciting day. After breakfast, the trail leads us Tilman Base Camp via Tilman Pass which is situated at an altitude of 5320m. Mostly the trek goes steeply up through the rocky moraine and descends another side for overnight stay at tent. After breakfast, we will begin our journey for today destination Tin (three) pokhari (sacred lakes) which is one of the major attractions of this route. Stay overnight in tented camp with hot food. After breakfast, we will start today trip to tranquil Lake Panch pokhari which is situated at 4123m elevation. The scenery of the pristine landscapes and Himalayan views are just awesome. Stay overnight at Panch pokhari camp. Rest day to discover around. This eye-catching setting is a secluded pilgrimage site where the Janai purnima festival is held in August. Many Hindu and Buddhist pilgrims visit this lake each year and we can see two pilgrim houses and the temple dedicated to Lord Shiva. Stay overnight at camp. The trail leads us gradual descent through rocky himalayan hills to reach our destination of Nasimpati for tented camp overnight. Rest of the day we enjoy mountains view and surrounded nature beauties. Stay overnight at camp. At the begging today trip, we enjoy the gradual ascent through rocky hills and rhododendron forest. Then we take it easy on the steep downhill section at the final day. From our campsite, you can relax and enjoy the stunning mountain views, or if you like to explore, you can gain some insight into the culture and daily life of the village. Stay overnight at camp. Today, along our journey to descend down hill walking we have some great mountain views then we start to ascend through the forest. Before reaching Pauwabas the trail lead steeply down. In Pauwa Bas there is a shelter for pilgrims to Panch Pokhari. Stay overnight at camp. We will have breakfast in Pauwabas as usual time and our guide will brief all about the area and its people, culture and history along the way of coming trail. Today’s walk is nice and gentle and we can enjoy our forest trails and wildlife spotting. Journey the journey, you can walk through the lush forest of rhododendron, oak, pine, and juniper and we can see some nomad’s houses for cattle on the way. Stay overnight at camp. The trail from here we get into solve descend through stunning, dense Rhododendron and pine forest. And then gently walk downhill to the Okhreni. If we are lucky and observant, we might spot some wild animals such as mountain deer or langur monkeys and Nepali bird life like the danfe (Nepali national bird). We spend overnight here with regular activities. We camp at Sano Okhareni near a pine forest and with great views to the mountains!. Stay overnight at camp. Today is our last trekking day in beautiful land with different vegetation and people live hood. About 5/6 hours of gradual downhill walking we get in Chautara. The trail goes through small villages where we can see how the diverse ethnic groups live side by side. We set our camp near by Chautara bazaar. We will celebrate trekking last night with Nepalese drum and popular folk song..
How much does Tilman pass trekking cost? Hike to Tilman pass cost is available now from USD 1,890 is standard trek price on double occupancy basis. In this price, we offer you Tourist Standard accommodation at our homestay located nearby Thamel, Kathmandu and of course, the trip price will vary according to group size. For the deluxe and luxury trekking tour plan, we add 3-star category hotel deluxe air-conditioned room in Kathmandu (BB PLAN) and with attached bathroom while on trekking on possible places. AND WE ARE OPEN TO CUSTOMIZE YOUR TOUR AND PACKAGES PRICE AS PER YOUR REQUIREMENTS. International tour leaders are highly encouraged to get discount and attractive complimentary. 3 night’s twin sharing hotel accommodation in Kathmandu within breakfast plan. We can organize private Tilman pass trekking starting at any date that works for you. Please contact us for more information. Question: Do I need the experience to do Tilman pass trekking? Answer: This trek is suitable for keen trekkers/walkers who are able to walk around 4 or 5 hours in a day, with a lightweight daypack. For this trekking, if you have about the little experience would be better. Question: What kind of accommodation can I expect on Tilman pass trekking? Answer: All the guest houses/lodges in Langtang trekking, they have attached restaurant and they cook a delicious range of mostly vegetarian such as Pasta, tuna bakes, noodles, potatoes, eggs, dhal bhat, bread, soups, fresh vegetables (variety depends on the season). While you are on camping days trekking, you will have delicious food prepared by our professional cook. Question: What opportunities will I have for a shower along Tilman pass trekking? Question: How do I get drinking water on Tilman pass trekking? Answer: During the trekking route there are some places hotel and shops where you can able to buy mineral water and you can buy it for drinking but however we advise against buying mineral water in plastic bottles, as currently there are no provisions for disposing of these. Instead, we provide you with boiled water or bringing chlorine tablets to purify the normal water as the normal water is available in campsite/along the way. Question: Is there any communication facilities on Tilman pass trekking? Question: Who will carry my luggage on Tilman pass trekking? Discover langtang Himalayas within 360 deg angle from Kyanjin ri / Tserkuri hill..etc. Walk through cultivated potatoes fields, colorful Rhododendron, conifers and oak trees. As the information about Tilman pass trekking stated above is just a guide and standard template what we provide you, however, the trip can be customized at your request to accommodate your specific requirements. Local politics, landslides, cancellation of local flights, weather, transport or a multitude of other factors that are beyond our control can result in a change of itinerary during on trip. Awesome Trek with great team. We did an outstanding trek from Panchpokhari to Langtang passing over Tilman pass – absolutely amazing views. Landscape changes frequently from rice fields to waterfalls to snow capped mountains with glacial lakes. Our trek leder Ram did a fantastic job teaching us about the history of the region and mountains. He knew the area so well and always knew the best place to setup campsites. Besides that, out porters were friendly and helpful. I would highly recommend Ram and the Gokyo Trek team to any planning a trek in Nepal. – Corina Schreiner, Berlin Germany.